Ever had the trouble of losing your car keys and get stranded outside of your car? Sometimes our car keys gets misplaced somewhere so we cannot unlock our car without the keys. Well fear not! 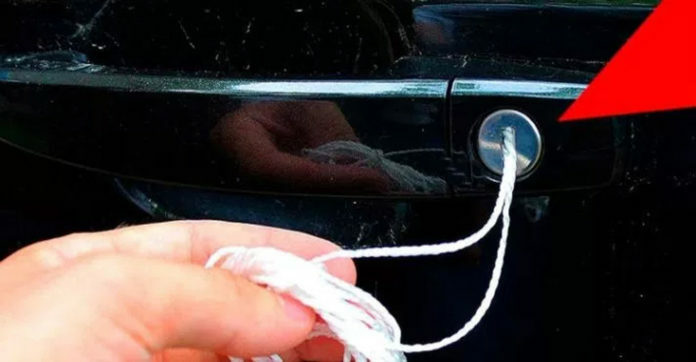 Here is a simple and sure-fire way that your car lock will be unlocked in no time at all! First, tie a knot by folding the string into half and place a small slip knot in the centre. Pull both ends to tighten the knot. Second, using the end of the string, slip it over the door frame. The string should be able to slip into the interior of the car without any problem. Next, try to loop the string over the lock’s knob and pull it to secure it onto the lock’s knob. Lastly, continue to pull the string until the lock pops up. It means that your car is unlocked!